I’ve seen images of the folding wood framed cots with undyed cotton canvas here and there over the past couple years, but with an updated twist. They are being used more as hip daybeds with fluffy toppers to make them cushy and are layered with lots of exotic throw pillows. Very inviting! There are some makers in Europe that are selling them at costly prices. I find them appealing because the contemporary utilitarian ones are now made with metal frames and polyester or acrylic fabrics. The hardwood and natural cotton canvas hearkens back to World War II and before when items were made from natural ingredients. While just wasting time this morning, I searched the internet for companies in the U.S that are still making the wood and cotton canvas ones and just couldn’t find any. I found one or the other, but not both. I found companies that were forced to move their production to Asia. I found very expensive European ones. I found vintage ones on Etsy and Ebay. But, sadly, I found none that are made domestically in the all natural ingredients. I think that I am going to ressurrect these folding, portable workhorses! What often leads my peers to the gallery to explore organic mattresses is their dismay with all of the mystery ingredients that are now in conventional mattresses and the trendiness of sleep science and technology. What are these new ingredients and who has done the research? Conventional mattresses are made with synthetic ingredients and we all know that synthetics do not breathe. We can apply this through experience with apparel because we all know what it feels like to have polyester or vinyl next to our skin. It is suffocating. However, most people don’t think about this with conventional mattresses. Memory foam is the worst, even if you aren’t going through menopause. I hear this complaint from men and women of all ages. In an effort to counteract the problem with temperature regulation in synthetic mattresses, manufacturers are creating and patenting proprietary gel and bio-infused synthetic materials that they claim (through whose research I wonder) wicks off moisture and adjusts body and mattress temperature to provide optimal sleep conditions. This trend alarms me. Try researching exactly what these materials are and they are all made with chemicals, still. If they just used natural ingredients, the problem would not exist. The brands of mattresses that The Organic Mattress, Inc. carry have organic cotton ticking and use wool as the natural flame retardant. Wool wicks off moisture and is a natural temperature regulator. For as long as men have worn suits to work, they still wear worsted wool in the Summer and aren’t overheating from it. It feels cool. The other ingredients in the organic mattresses are springs, e pocketed coils and/or all natural latex rubber. Women my age ask if they will overheat in natural latex rubber. No. It is not synthetic and it has holes. It breathes. The entire mattress breathes. Natural fiber mattresses can cost more than synthetic fiber mattresses because natural ingredients are more expensive than synthetic ones. The advantages, however, far outweigh the expense. Your face and body aren’t absorbing chemicals all night, many of which have been associated with brain fog, ADD, Autism, thyroid disorder, lower sperm count, asthma …on and on. Chemical flame retardants are linked to physical and cognitive health problems. Natural latex rubber lasts far longer than synthetic foam. It breathes. Most “organic” or natural fiber mattresses have warranties of 15 years or longer. What our pores and bloodstreams absorb are every bit as serious as the foods that we ingest. While I’m on my natural mattress throne, I would like to add a couple more comments about creating a better sleeping environment. Your pillow should not have sensors, monitors or play music. Don’t lay on a smart pillow and read a Kindle until you fall asleep. The fewer electronics that are in the bedroom, the better. EMF’s interfere with our brain wave patterns. Knock off all electronics a couple hours before trying to sleep. Blue light from electronics disturbs sleep. Choose natural fiber bedding accessories for airflow. Polyester sheets are increasingly popular due to their price points, but polyester doesn’t breathe. Joni Mitchell did have it right and still has it right. We’ve got to get ourselves back to the garden. I didn’t know this was a trend. I went onto the internet to get inspiration for fringed fabric tassels and stumbled upon it. As a tail end Boomer, I don’t attend any weddings, showers or decorate baby nurseries. But, I wound up on Pinterest and was inundated with images of dream catchers and scrap fabric garland tassels in the setting of bridal showers, baby showers and nurseries. My reason for searching was that I am siting upon piles of fabric that need new life breathed into them. So, here you go. I must say that I truly love the tee-pee idea in a toddler’s room. I like that the room is light and bright, still providing stimulation. It is a refreshing change from choo-choo trains and lollipops. The hanging macrame bassinets outright scares me. It is very cute, but the chances that we take with plants shouldn’t be equal with those that we take with newborn babies. I would want that attached to a set of firm legs that meet the ground. Living in New England and having had dreadful weather all winter and into Spring makes me long for any type of an outdoor celebration with flowers, plants and a meal. I’m craving a 70 degree day in our near future. I’ll sleep in a teepee if we get one, too. I stumbled upon their website through Martha Stewart’s ‘Made in America’ website and link to her ebay shop. We all wore these bracelets in the 1970’s where I was raised in Massachusetts. We didn’t live on Cape Cod, but everyone vacationed there. So, these bracelets were a symbol of our ties to Cape Cod, the ocean and New England nautical life. Back in the 70’s, they came in natural only. There were no dyed color options. 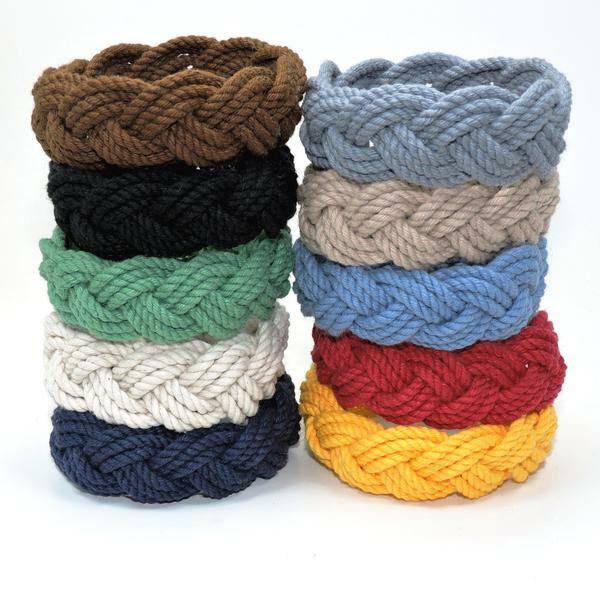 What is delightful about these rope bracelets real people make by hand is that they ring in at $5-$7.95 each!!!!!!! 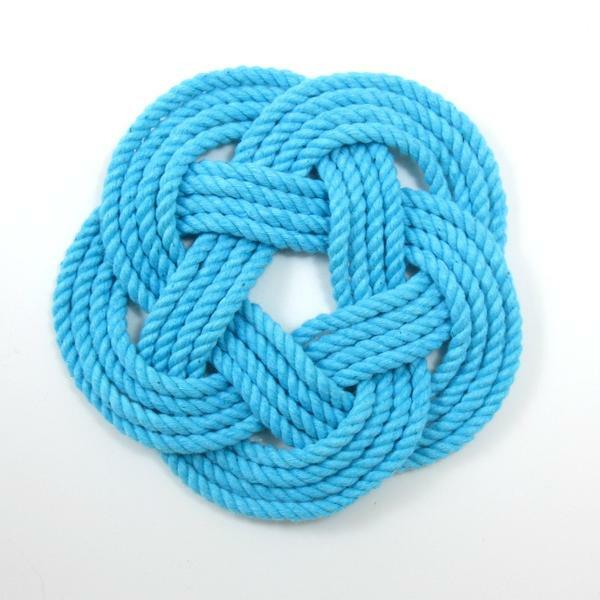 They offer an array of rope knot products that they didn’t in the 1970’s. 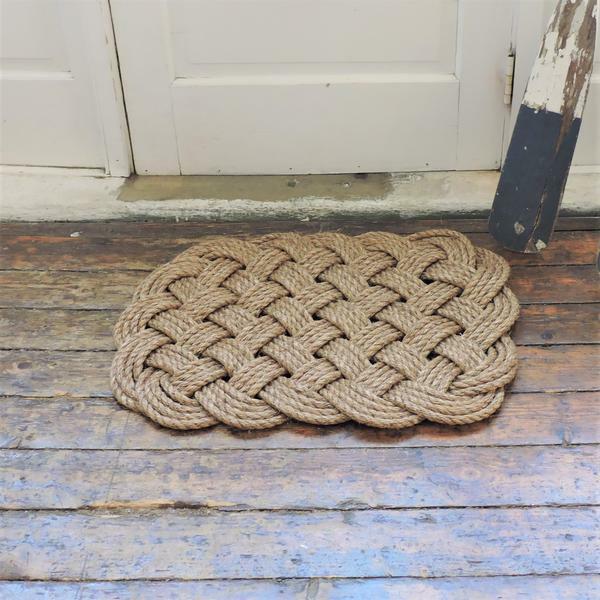 Door mats, coasters, key chains, dog toys, napkin rings, door stoppers, drawer pulls, necklaces, trendier bracelets and ornaments. However, the classic sailor bracelets appeal most to me. Take a look. 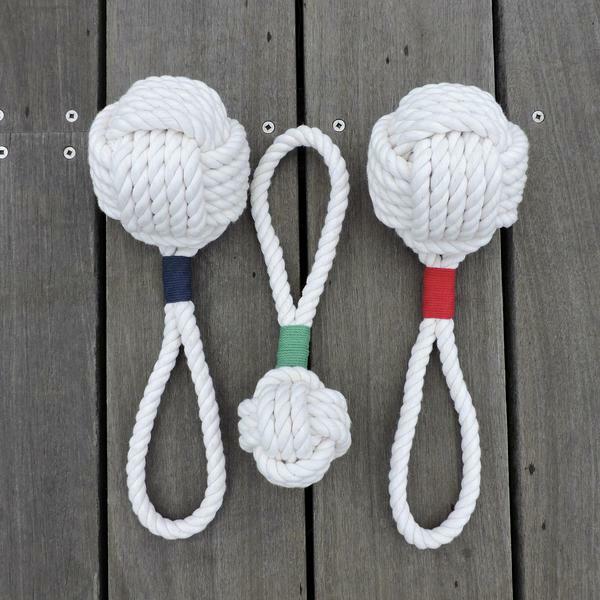 Classic sailor bracelets in nautical colors. My favorite- Sailor bracelets in happy colors.